Yesterday, we buried a friend. A woman buried her husband. A man and a woman had to say goodbye to their little brother. Another man and a woman said goodbye to their big brother. Uncles and aunts had to file past their nephew in their last goodbye. So did their children. Nephews and nieces had to learn that goodbyes can come too young. And a lot of other friends were like me: stunned, crying, telling stories and then smiling in our goodbyes. Goodbye, Shawn. Tell my mom and everyone else I said hi. My Disneyland Matterhorn webcam iGoogle gadget is working again! HoJo changes the address frequently to keep people out, but they VERY nicely let me access the right address so iGoogle user can have this webcam again. If you’ve never seen it before, this is one of the best webcams out there and a must for Disney park fans. Howard Johnson’s runs this cam themselves; it swivels showing a number of landmarks such as a couple different views of the Matterhorn, one including the peak of the castle; Space Mountain; Twilight Zone Tower of Terror; and more. So take a peak into Walt’s park. And if you have an iGoogle page and would like to watch it from there, you can get my gadget here. You have to have an iGoogle account, of course. My friend Shawn died this morning. I’m just stunned. Then I cry, then feel surreal again. I grew up with my friend Ann, Shawn, Jake and their whole family since I was 12… I started in the 7th grade at St. Joseph’s in Swedesboro one day, and I wasn’t there 15 minutes when this other girl passed me a note. A note! Way to start off as the new kid to the school: get caught passing notes…. But we didn’t; the note said, “My name is Ann. Welcome to the class! Why don’t you sit with me and my friends at lunch?” Just like that: taking in the new kid, making sure she had a friendly place to be at lunch. We all got so close that they called my mother Mom, and I called her parents Mom & Pop. They’d introduce me as another sister, which always drew surprised stares because Ann and her family are black, and if you know me, you know I’m what Jack Benny called “frog belly in the moonlight white”. To the surprised glances, Ann, Jake, or Shawn would say that I was the white Webster or that I came from the light side of the family… After the movie “Remember the Titans” came out, they used that line: of course she’s our sister. Can’t you see the resemblance? So many years; so many memories…. So many times in the past few years, we’d say we’ll get together and we get busy and you don’t…. I so wish I had been there more often for him. He went into the doctor’s for test and they were going to do angioplasty on Wed; following that, they ordered surgery for yesterday. That’s when Ann called me; the surgery had gone fine. Shawn was relaxing. Without thinking, I said I’d go to the hospital today to see him and just say I was his sister so I could get into CCU to see him. That brought back the old laughs: the white Webster. And Ann laughed: Of course she’s our sister. Can’t you see the resemblance? Then I got her call first thing this morning; suddenly, at 2:30 this morning, Shawn was gone. His mom and dad of course needed to collapse tonight; Ann’s blood pressure sky rocketed, so she had to lay down too. And I sit and think: why didn’t I go last night? Or any one of the hundreds of nights that I didn’t in the past years? You’d think I’d have learned from losing my Mom…. say the things you should say; do the things you should do – like get together with the young man who proudly called you his sister. I get mad at myself for crying and hurting, because I think what right do I have? Where was I the last few years? But my sisters and niece Jenna reminded me that if our positions were reversed, I’d be proud that I meant so much to Shawn still that he’d cry for my loss. That if you had asked him just yesterday about me, he’d say I was his friend. And he’d better not tell my mom anything I didn’t want her to know! Anyway, if you haven’t seen this show, I highly recommend it for fans of British comedies. I also like the spinoff series, especially when it settled into what it should be – how it should be different – and especially for the chemistry between Humphries and Mavis. I wish we could have seen a few more seasons to see how things would have resolved. Since I did come into it late (as I’ve done with so many things like The Avengers, Sherlock Holmes, and more), I did a search for items and came across a lot of great videos, books, and sites. 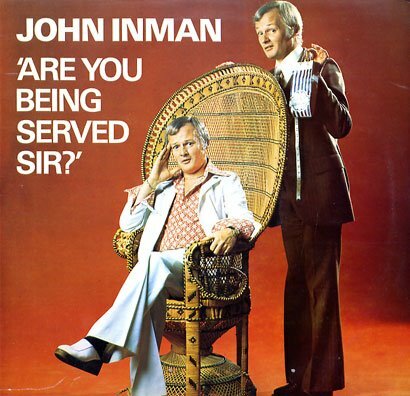 I was really glad that I stumbled on the ones who did a tribute to John Inman, who because so famous, deservedly so, here and in his home native England. As someone said, he became famous in all these places not for special effects, scandals, putting himself in the media with his life, but for playing a character well and for being such a good human being himself. If you’re a fellow fan, let me share it with you.